Logitech has produced numerous mice and keyboards until in the recent years, creating more audio and gaming products for the consumer market, as well as videoconferencing equipment for business users. 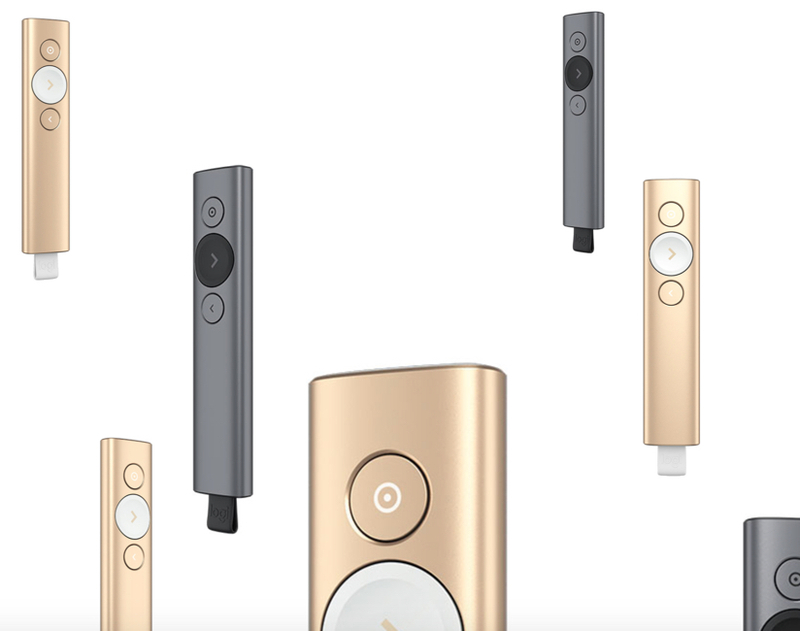 Early this year, Logitech announced a significant revamp of their presentation control with the Logitech Spotlight Presentation Remote. 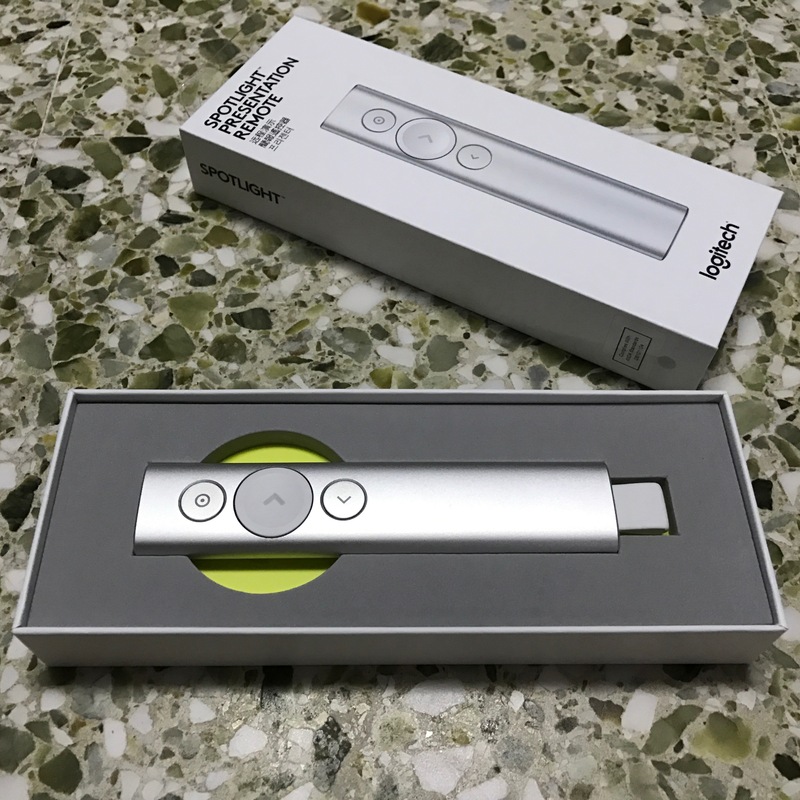 Unlike the traditional slide clicker or laser pointer of the past, Spotlight is designed to facilitate a professional presentation. Spotlight is enables each presentor to highlight and magnify on-screen content in an engaging and powerful way so you can better underscore your point. Packaging is straightforward – the clicker, charging cable, leather pouch to keep the clicker and simple instruction menu packed into a pleasant looking case. 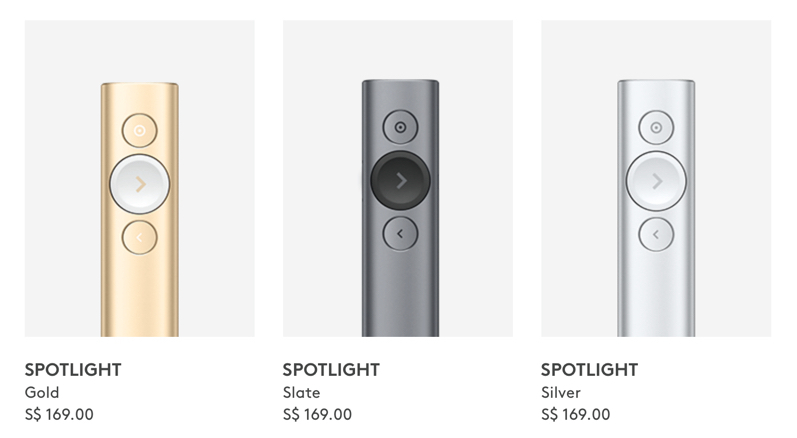 The Spotlight is striking but simple, good differentiation from those black and gray mouse-like gadgets out there. 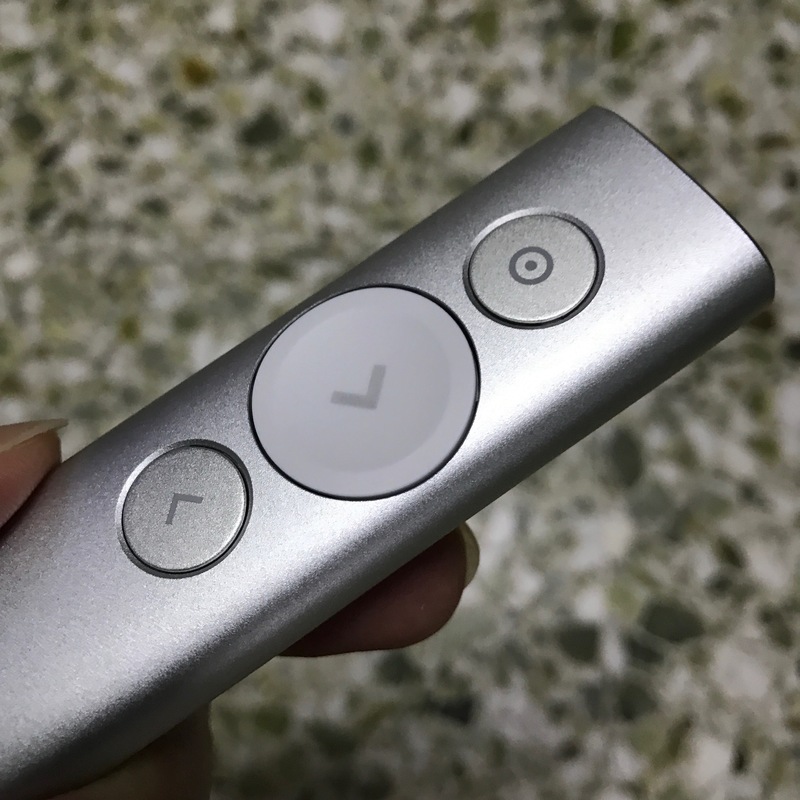 – two smaller Spotlight buttons the same color as the remote’s body. 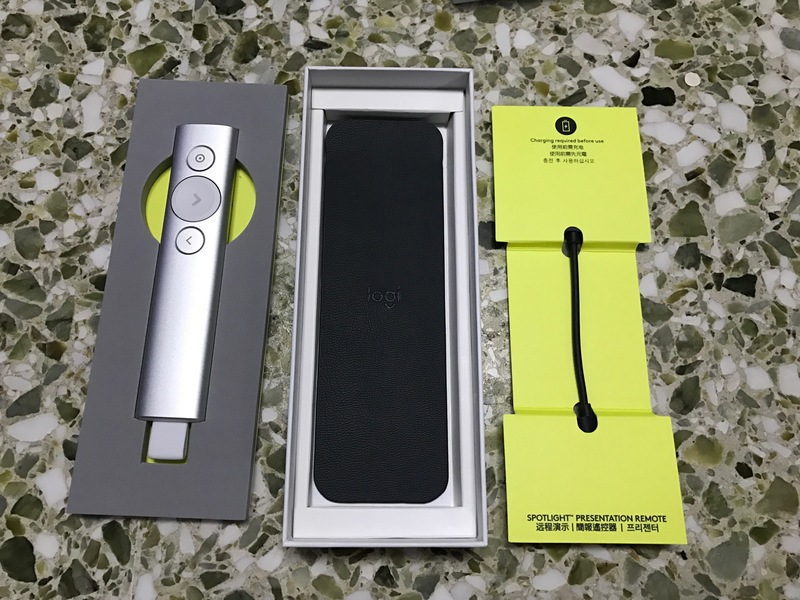 The flat rectangle of rubberized material on the underside helps ensure a firm grip on the otherwise smooth remote, without interrupting its contours. 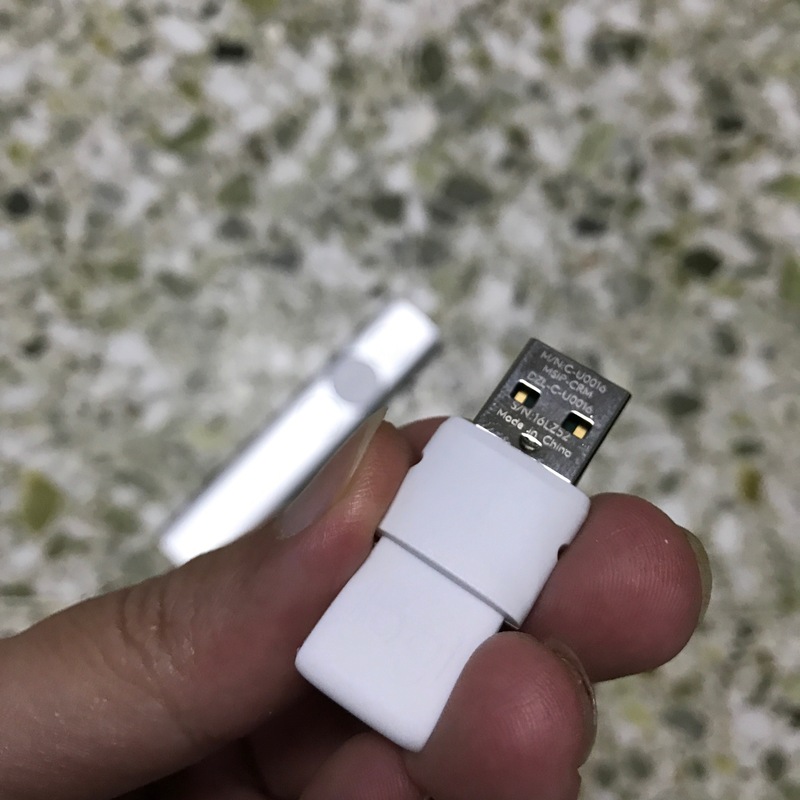 A wireless USB receiver fits into the bottom of the Spotlight and features a small rubber loop to easily pull it out. 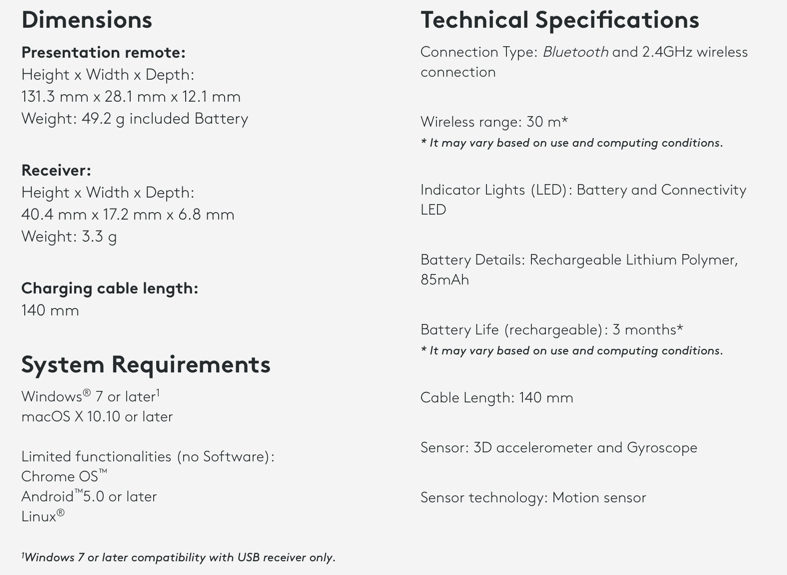 The receiver is standard USB-A; it plugs into your computer and connects to the Spotlight over a 2.4GHz wireless signal. 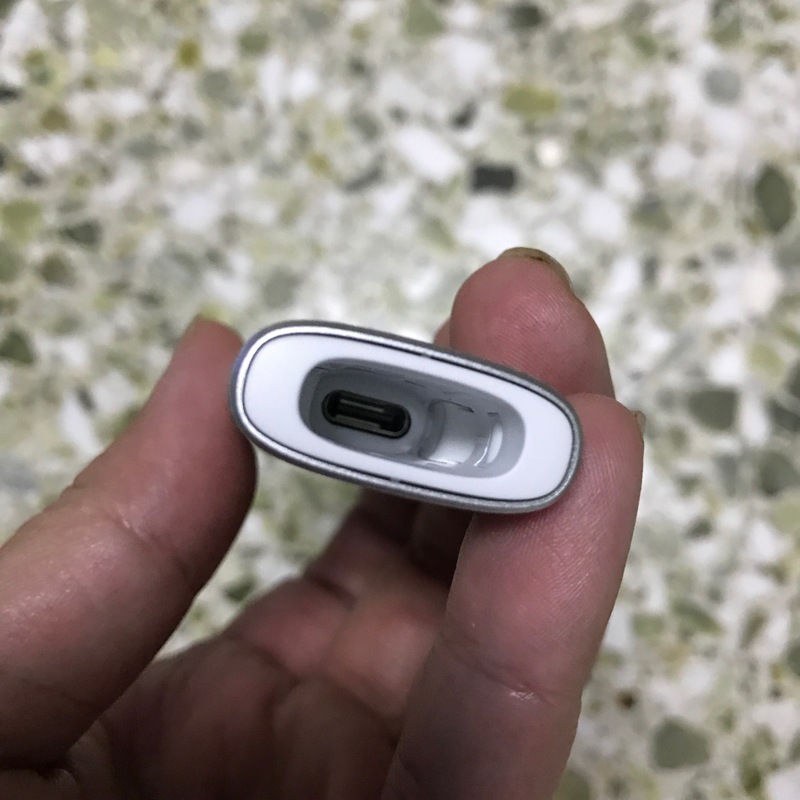 A USB-C connector sits inside the recess for the receiver, letting you charge the Spotlight with the included 5.3-inch USB cable. 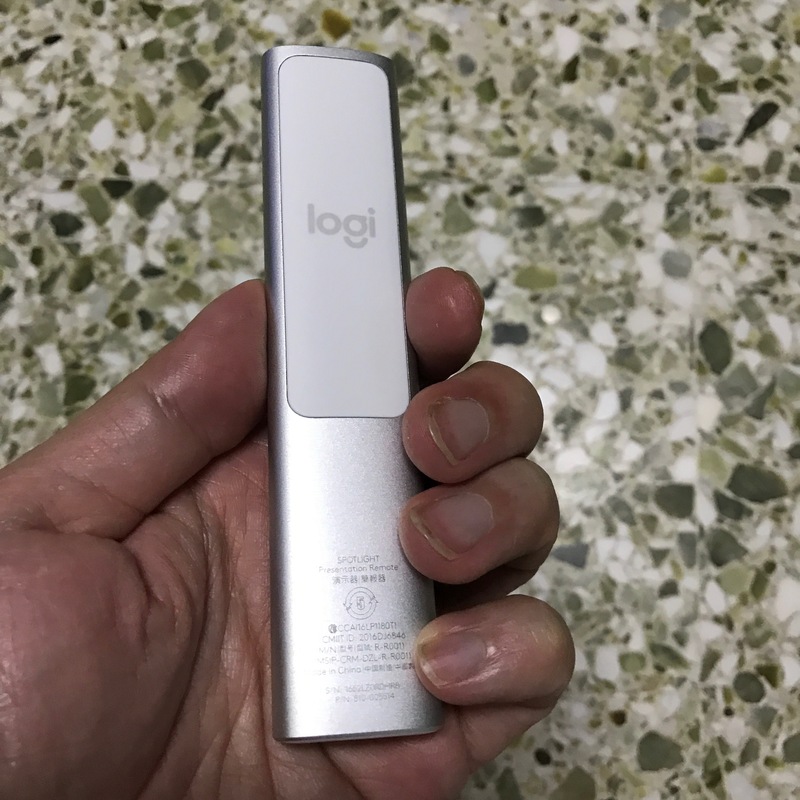 According to Logitech, the remote can run for three hours after just one minute of charging, and can last for three months on a full charge. The Spotlight can also connect to your PC over Bluetooth. 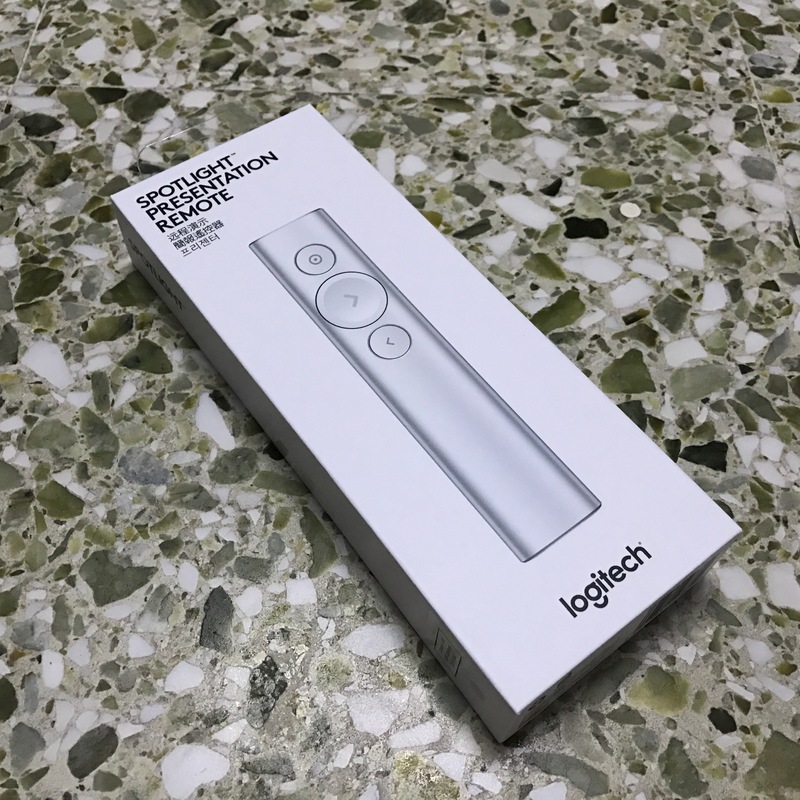 Logitech says the remote has a range of up to 100 feet using Bluetooth 4.0 or the USB receiver; that seems accurate from our testing. 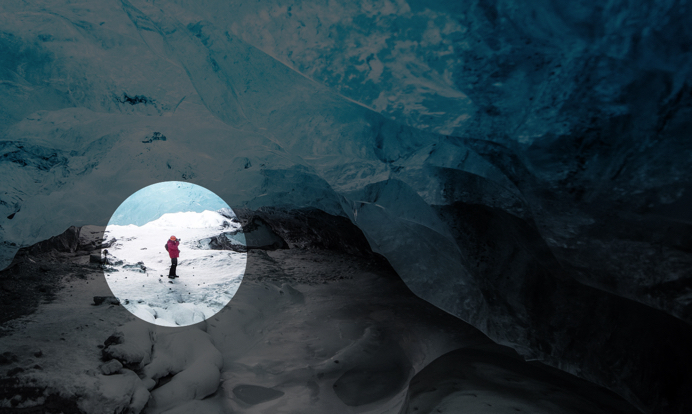 Spotlight pairs with a powerful Spotlight App so you can set the stage even before your presentation begins. 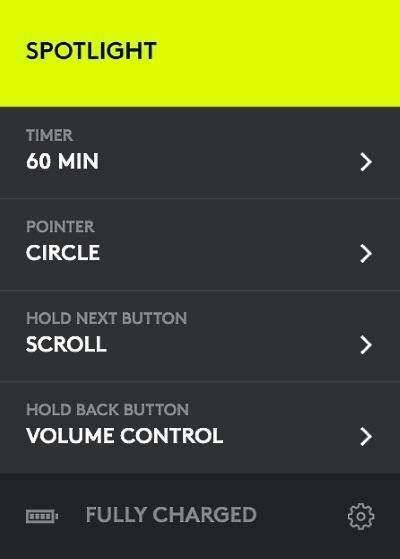 In the app you can toggle pointer mode, set timed vibration alerts or activate more advanced functions like volume control with hand gestures. The buttons will work normally if tapped, but if you hold them down you can blank out the screen, rapidly jump backward in your presentation, scroll up and down, or adjust the connected computer’s volume. 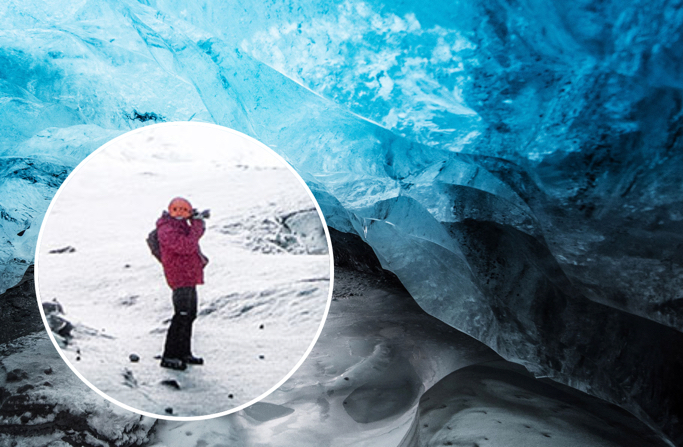 Tilt the Spotlight up to scroll up or increase the volume, and tilt it down to scroll down or lower the volume. You can also set a custom keystroke to either of those gestures. The Spotlight do offer a built-in timer. Once you set how long you have, the Spotlight will silently vibrate there are five minutes left, and again when your time is up. You can also display a timer or clock on the screen during your presentation. The Spotlight app for Windows and OS X controls all of these settings. Besides mapping the custom functions and choosing pointer-enhancement modes, you can use the app to adjust the pointer speed, or grow or shrink the Highlight/Magnify/Circle areas on the screen. The app is structured like a mobile app with large, easily identifiable icons and text in a borderless, portrait-oriented window in the middle of the screen. It completely disappears during presentations.